Variants of Frigg’s name include Frigga, Fricka and Frija, and it means “wife” or “beloved one”, ultimately deriving from a word meaning “to love”. 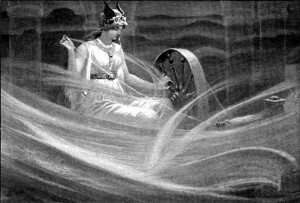 Frigg gave her name to Friday, and is occasionally identified or confused with Freyja, although both goddesses are mentioned in the same text. She was the daughter of Fjorgynn and the wife of Odin. As such, she was the queen of Asgard, where she lived in the hall Fensalir. She was attended by her handmaiden Fulla, who was herself a goddess. Her sons were Balder and the blind god Hodr. Frigg was a mother goddess, and associated with love,marriage, fertility, and domestic arts. She was worshiped mainly by women, and very important to them, invoked for births, marriages, and other major events in a woman’s life. 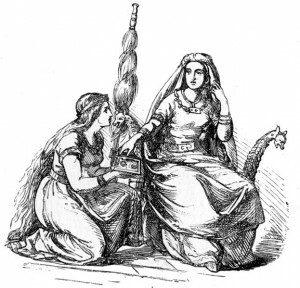 As Odin’s wife, she was queen of Asgard and the only one,besides Odin himself, who was allowed to sit in his seat and look out across the world. It was a sign of Frigg’s dependability and Odin’s trust that he shared his knowledge with her. She was also a prophetess in her own right, but she never revealed her foreknowledge. As a role model for wives,she kept the secrets which her husband shared with her. Unlike her equal in the Greek pantheon, Hera, who was famous for her angry efforts to sabotage her husband’s love affairs and kill his lovers, Frigg never showed any jealousy of Odin’s affairs with other women. At some point, Loki accused her of being as wanton as Freyja, and sleeping with Odin’s brothers Vili andVe. There were several rumors and stories to this effect, but nothing clear, and if it was true, Odin did not seem to mind. Frigg was mostly a gentle, wise goddess who supported her husband and was protective of her children. When she foresaw that Balder’s life was in danger, she set out to make every living person, creature, and thing promise that they would not harm him. The only thing she did not ask was the mistletoe, thinking it too insignificant to do any damage. As a result of Balder’s new invulnerability, the other gods amused themselves by shooting him, throwing knives and axes at him, and swinging at him with swords and spears, none of which ever left a mark on him. However, Frigg’s efforts proved in vain when Loki tricked her other son, blind Hodr, into throwing a mistletoe dart at Balder, which promptly killed him. A grieving Frigg tried to retrieve Balder from the underworld, and Hel agreed to let him go if everyone in the world would mourn him. An old giantess named Thökk (suspected to have been Loki in disguise)refused to mourn for Balder, so Frigg’s son had to remain in Hel’s realm. A devoted wife and mother, Frigg was both a fertility goddess and a patron goddess of wives in the Viking tradition– strong and capable in her own right, wise and thoughtful,and always supportive of those she loved.